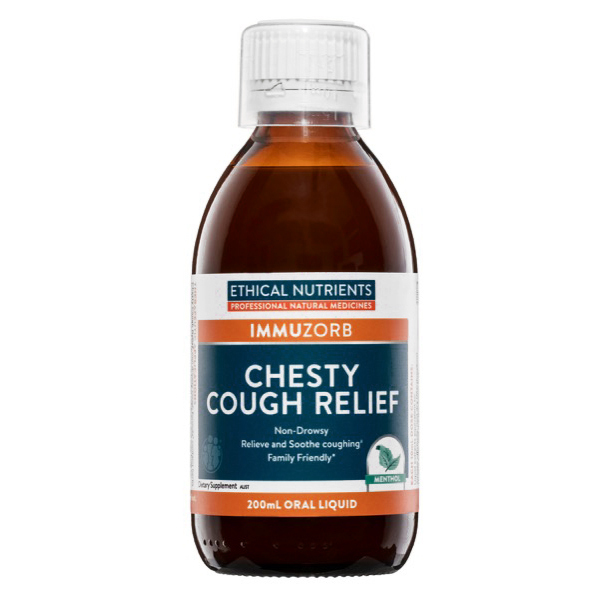 Ethical Nutrients IMMUZORB Chesty Cough Relief contains herbs traditionally used in Western herbal medicine that may help to relieve and soothe coughing. - Relieve and soothe coughing. - Assist the expectoration of mucus. - Temporarily relieve coughs due to bronchial congestion. - Is suitable for the whole family. Adults: Take 10mL every four hours. Children 2-4 years: Take 5mL every four hours. Children 5 -12 years: Take 7.5mL every four hours. If coughing or symptoms persist consult your healthcare professional. Do not use if cap and/or bottle seals are missing or broken. Ethical Nutrients IMMUZORB Immune Defence, with Echinacea and Andrographis to help fight 7 symptoms of cold & flu. Ethical Nutrients IMMUZORB Sore Throat Relief, a natural alternative for soothing irritation in the throat. Ethical Nutrients IMMUZORB Cold & Flu Relief is a traditional herbal decongestant formula to reduce the severity of cold & flu symptoms.